The ImmunoID NeXT Platform is designed specifically to enable the development of more efficacious cancer immunotherapies. While the success of checkpoint blockade has been hugely promising, it’s increasingly apparent that predicting response to immunotherapies and developing new ones requires a more comprehensive approach to tumor immunogenomics. By combining highly-sensitive, exome-scale DNA and RNA sequencing with advanced analytics, ImmunoID NeXT provides a multidimensional view of the tumor and the tumor microenvironment (TME) from a single sample. For the first time, oncology translational and clinical researchers can comprehensively characterize both the tumor- and immune-related components of the TME using a single platform. 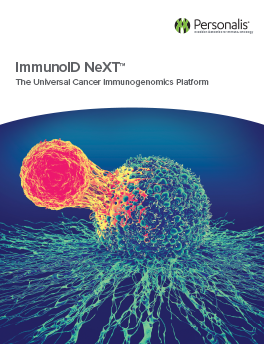 The ImmunoID NeXT Platform enables customers to maximize the data generated from precious tumor samples. It also decreases the complexity of data interpretation by eliminating the need to integrate multiple assay technologies and reporting formats from several sources.